Quirky books and their covers. 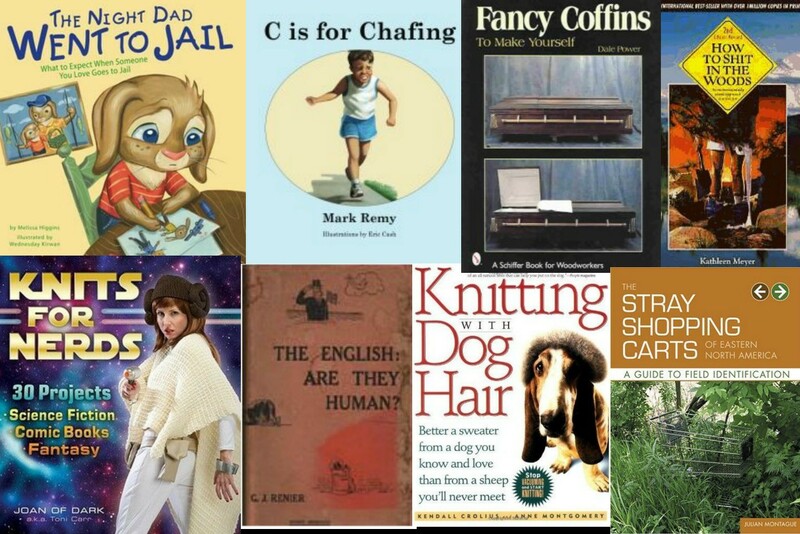 Yesterday I was doing a spot of book browsing on the internet when I came across a how-to book entitled Fancy Coffins To Make Yourself by writer Dale L. Power … and thus ends the story of how this blog post was born. Believe me when I say I could have spent all day searching for quirky books, original covers and unique titles, but there does come a point in every internet users life when you have to stop subjecting your eyes to screen glare — you know exactly what I’m talking about. So can we take anything from this pint-sized post of quirk? I think yes — brace yourselves for a splash of warm and fuzzy sentimentally — from Genichiro Yagyu’s book All About Scabs, to Awk Ro’s Field guide to Cosmic Flora, if you feel so passionate about something that you want to put it all down on paper and send it to a publisher, then do it. Diversity is alive and kicking in the book world. “Be who you are and say what you feel because those who mind don’t matter and those who matter don’t mind.” — Dr Seuss. Posted by bookishblurb on August 25, 2012 in Buzz and tagged Book Covers, Fun, Quirky.